One of the first impressions you’re going to make at a job fair is by how you’re dressed. At a job fair, you should wear “interview attire.” This includes button down shirts, blazers, slacks, pant suits, or a professional dress. Start thinking about your career fair outfit ahead of time. You don’t want to wait until the day of the event to realize that your shirt is missing a button and your dress pants don’t fit like they used to. Give yourself enough time to purchase, dry clean, or iron the outfit you plan to wear. Your clothes aren’t the only thing that will make you stand out to an employer. When meeting with recruiters, be sure to deliver a strong, confident handshake. According to body language experts, a strong handshake shows confidence and portrays your interpersonal skills. These personality characteristics are key for recruiters who are searching for new employees at career fairs. An elevator pitch is a 30-second speech that summarizes who you are, what you do and why you'd be a perfect candidate. As you put together your elevator speech, you may come to realize that talking about yourself is difficult. It’s even more challenging to pack in all of your experience and accomplishments into just 30 seconds. Once you’ve written your pitch, memorize it. Say it to yourself over and over again. Rehearse it in the mirror four or five times every night. The more you are familiar with your elevator pitch, the more confident you can be when delivering it to a potential employer. Obtain a list of the companies that will be attending the job fair from career services. Use this list to research what each business does, what positions they have open, and any current events they have happening. This knowledge will help you prioritize which businesses you want to speak with, as well impress recruiters. Don’t be caught without an extra copy of your resume! Fill your folder, briefcase, or portfolio with enough resumes to go around. Use the list of companies attending to give you an idea of how many copies to make. 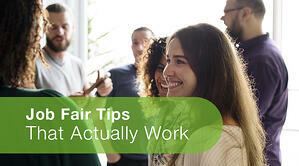 There’s a lot to consider as you plan to attend a job fair. Make sure you make it worth your time by being prepared, staying confident, and showing your passion when speaking with recruiters. Making a great first impression at a job fair will significantly increase your chances of hearing from the employer again after the fair has concluded.